Even seasoned pros sometimes are in awe of a legendary figure. I have covered many events in my life and met some amazing people, but this past weekend my goal was to meet and take a photo of Joe Pa. Goal accomplished. In every job no matter what, you need to set a goal. Setting goals keeps you focussed and gives you a great deal of confidence when your goal is achieved. My goal on Saturday was to get a good photo of the legendary coach whether it ever saw the light of day in any paper or magazine. I wanted it for my own reasons. Sometimes personal goals and business goals can be shared and will benefit each other. While studying the coach and looking for the shot I wanted, I took several other photos that have been published already. 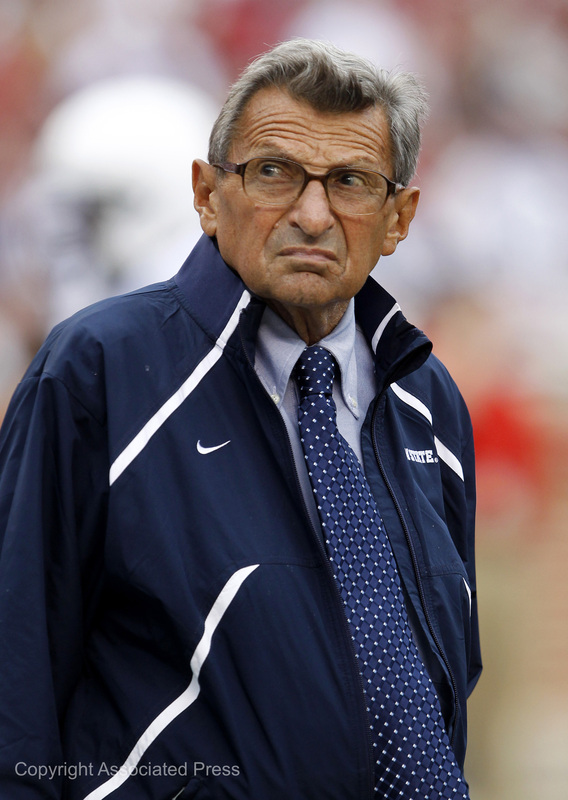 In this image Joe Pa is looking around the stadium as if reflecting on a friend and fellow colleague the “Bear”. This is the image I wanted and he may not have thought of Coach Bryant at any point, but I’d like to think this was his moment to say goodbye to a friend. When working with children sometimes they get frustrated with someone telling them look here, smile, turn this way. 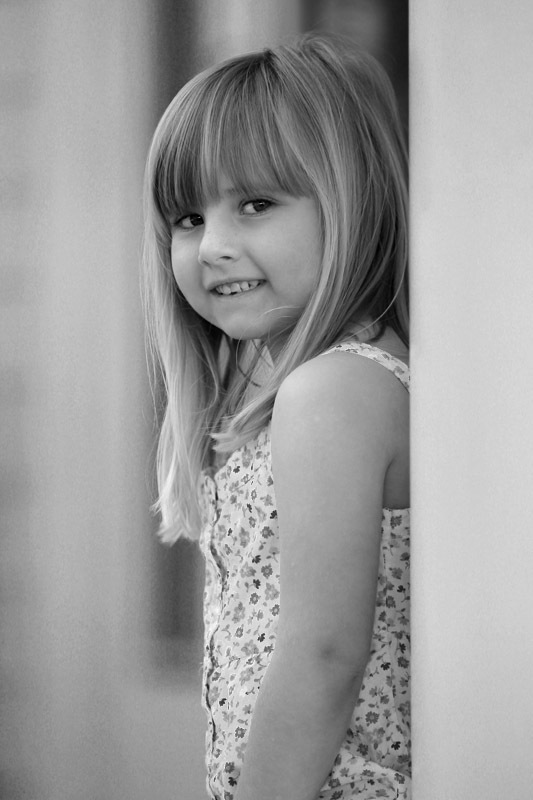 On this shoot, the young girl was growing tired of the commands so I told her to rest for a minute and she proceeded to lean against the column. Once she relaxed she started to play by peeking around the column and smiling. I let her play for a minute and then snapped this picture. She was showing her true personality and you can only get that from a natural pose. Don’t force poses, but let them happen. I love to photograph kids from a distance with a long lens so they are unaware I am taking their photo. They are not intimidated by the camera or afraid, but just being themselves. When covering a sporting event your goal is to capture the defining moment in a game that in one photo can tell the whole story. In this photo of Eryck Anders hit on Texas quarterback Garrett Gilbert in the final moments of the game is the defining moment. Texas had a chance to drive the field and go for the win. Alabama’s defense had another plan and that was to disrupt that opportunity at all cost. On the second play of that drive Anders hit Gilbert causing a fumble and Alabama recovered. 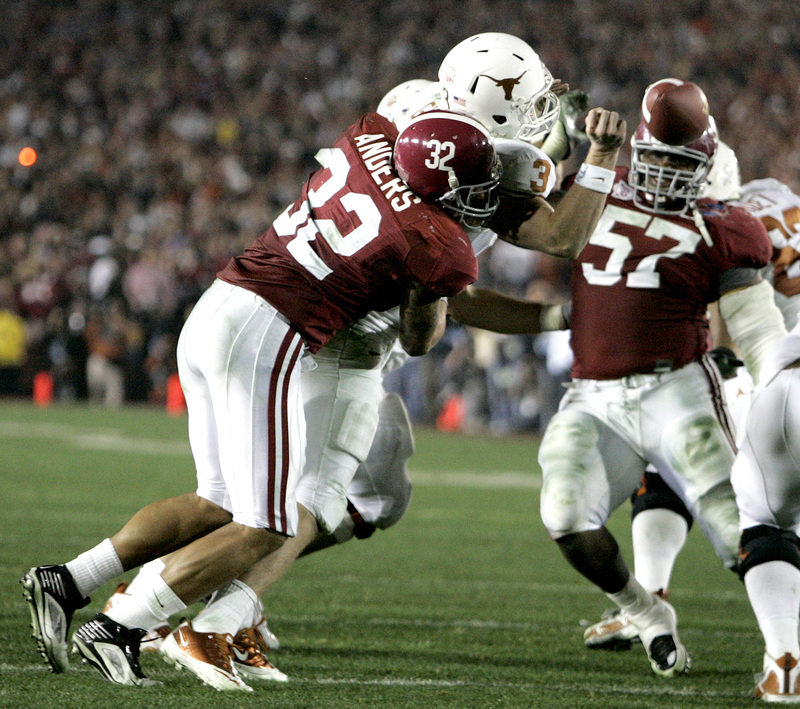 A few plays later Mark Ingram scored the touchdown to seal the win for Alabama. One play, one moment, and history is defined. When I used to work in a camera store, people always asked me how to prepare for their trip to take better pictures. Some of them would be going on a once in a lifetime adventure to places like Africa, Brazil, or Alaska. They were purchasing their new camera and then wanting to capture amazing photos in just a few weeks. First of all, I don’t recommend this to anyone, if you know you are planning a trip start early with learning how to use your new camera. However, I wanted to help them as much as I could so the first step was telling them to practice practice practice. With the transfer into the digital world practice is cheap and you can view instantly your progress. So how do you teach someone how to shoot wildlife in just a few weeks so they don’t waste their trip. I started thinking where can one find wildlife that is readily available, easily accessible, and natural environments. One day as I was sitting on my deck watching two squirrels chase each other it hit me, here is the perfect solution. I came up with a series of exercises to photograph squirrels and chipmunks that would increase the probability of making an amazing photograph on their adventure. 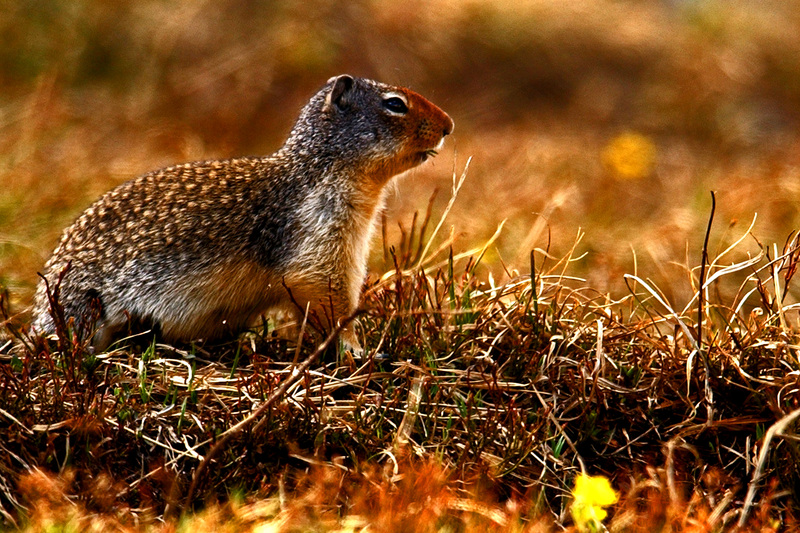 If you can take a good picture of one of these little creatures, then you should be able to capture a lion or bear when it is sitting in a picture perfect setting. Over the next few blogs we will be discussing some of these exercises to help improve your photos. The first lesson is the profile picture. A clean background is very important so that it is not distracting to the subject. You can achieve a clean background in two ways, the first is to make sure your subject is in front of a nice picturesque background. That might be a little difficult to reposition a wild animal. The other option, and the choice of many is to eliminate the background. You can achieve this by changing the aperture of the lens to its largest opening in the range of 2.8 to 4.0. This change reduces the depth of field your camera can record revealing a blurred, soft background, as seen above, causing your subject to stand out. Another thing to take into consideration is to capture a flattering pose. Just as if you were taking a picture of a human, you want to consider the some of the same techniques. First is eye contact. In a profile picture eye contact is critical to create an interaction with your viewers. Second, you want to make sure the head position is natural and not distorted. This takes a little patience to wait for the right moment to get a natural looking head profile. The last thing to cover in this lesson is you want it to be sharp. The most frustrating thing is a great picture that is soft and no detail. In shooting an animal portrait, detail is very critical to give definition and dimension to your image. To achieve sharp detail you must use a tripod or some stabilizing devise to steady your camera. Now that you have a few tips go out in your backyard and take a few pictures and practice practice practice. Covering Talladega is like a box a chocolates, you never know what you are going to get. As stated in an earlier post patience is the key for a moment like this. You have to be ready to press the button at any second and this whole sequence of photos only took 4 seconds. Several photographers around me didn’t get the shot because their cameras were down by their side and you can’t react quick enough. The key lesson to learn is photography is not a reaction it is a readiness for something to happen. You have to anticipate the moment before and then record it. On the last lap at Talladega anything can happen and usually does, so anticipating a close ending can result in many things from a clean pass to win, a block to hold onto the win, or as in this case a wreck for the history books. Plan and you will get the shot no matter what the outcome will be. The spring race had a nice surprise on the last lap as Flippin Carl Edwards flipped through the tri-oval. This weekends race should even be more exciting with the just a few races left in the championship. I shot more pictures in the last 10 minutes of that race than I did in the first 180 laps. Patience is the lesson to learn, you can’t force a photograph you just have to be ready to capture the moment when it happens. Study your subject and anticipate when and where you need to be. Preparation is a key to catching the moment. Know you subject and put yourself in the right positions.